To the early Hawaiians the mo'o (lizards) was a symbol of good fortunate and spirituality. As swift and agile creatures, lizards are one of the most powerful and oldest of Polynesian guardian spirits around today. The laser-etched design portrays these graceful little reptiles intertwining amongst tropical Monstera leaves which ill surely bring good mojo to your atmosphere. Who doesnt love good mojo while their performing? This Tenor ukulele is crafted with a mahogany body, walnut fretboard and signature Luna pearl moon phase inlays. 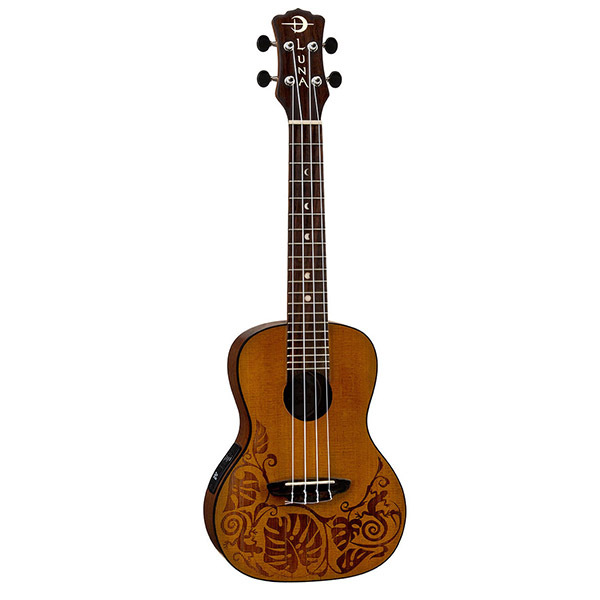 Pair this tenor ukulele with tuner, chord chart and travel bag, youll be ready for any gig at any time! Join the Luna Tribe!